A sign from the Block protest. Image: taken by Sean O'Grady. 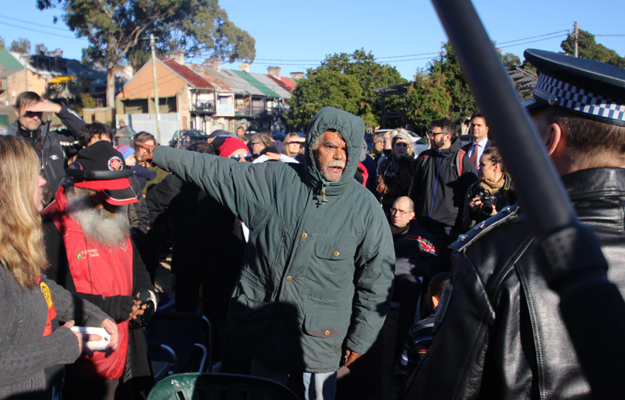 Protesters gathered at The Block in Redfern early on Monday morning to support the Redfern Tent Embassy and delay plans by the Aboriginal Housing Company (AHC) to redevelop the land. Organisers of the protest, dubbed ‘Blockade for the Block’, were expecting bulldozers to arrive at around 6am. However, developers did not appear at The Block at all, and protesters celebrated mid-morning when they were told construction would not commence if work had not started by 9am. By 10am, approximately 200 people were gathered at the Tent Embassy, a number that had swelled from 40 protesters at 6am. National Union of Students NSW Indigenous Officer and Blockade for the Block organiser Kyol Blakeney said approximately 30 people had slept out on The Block the previous night. Munro set up the embassy on May 26 in opposition to the AHC’s plans to build a commercial district on The Block including student housing, a childcare facility, a gymnasium and 62 low-cost housing dwellings reserved for means-tested local Indigenous residents. The Block is a significant site for many Indigenous people due to its rich history of Aboriginal resistance and self-determination. A man speaks to police at the protest. Image taken by Sean O’Grady. While the protest was generally peaceful, a man unconnected to the embassy was arrested for harassing protestors. A small group of protestors scaled the Aboriginal Housing Company building and Redfern Gym to unfurl banners, which read, “Black Law Black Land”, “Sovereignty never ceded” and “Hands off The Block” respectively. Shortly after 9 am, Redfern police were called to The Block following complaints of assault, though no charges were officially laid. Relations between the police and embassy protesters appeared mostly positive, bar some accusations of selective enforcement. “The Police Commander [Luke Freudenstein] is a lot better than his foot soldiers. They’re very racist and arrogant,” said Jenny Munro.